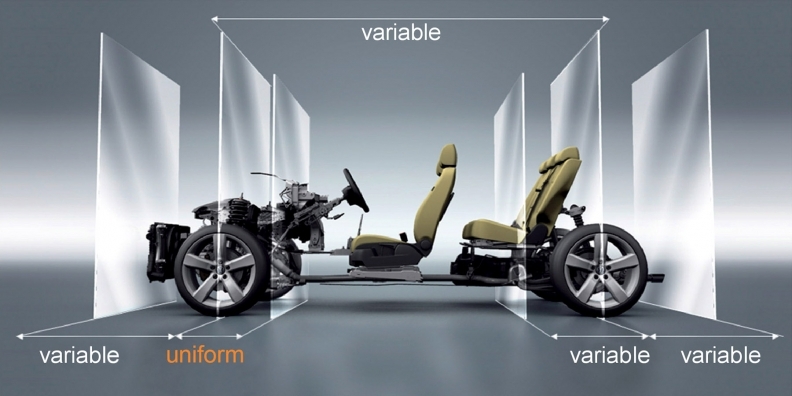 With VW's MQB architecture, only the engine position and distance between the front axle and pedal box are fixed. Virtually all other dimensions are variable. Correction: Auto analyst Stuart Pearson works for Morgan Stanley. A previous version of this story misstated his place of employment. Before the end of the decade, Volkswagen Group will reap massive savings from its new MQB architecture, giving the company another weapon in its bid to become the world's largest automaker. The economies of scale from making more than 4.6 million vehicles based on one architecture will result in 14 billion euros of cumulative cost savings for VW Group by 2019, Stuart Pearson, an auto analyst at Morgan Stanley in London, wrote in a recent report. "VW's MQB toolkit may be the single biggest cost-saving initiative ever mounted by any automaker," Pearson wrote. VW Group CEO Martin Winterkorn said the automaker will need to recoup the substantial development and start-up costs for the architecture, but in the mid to long term, MQB "will deliver substantial savings in unit costs, one-time expenses and the production of our vehicles." Production time will be cut by about 30 percent, Winterkorn added during a speech to shareholders at the company's annual meeting on March 12.